The countries of the former Eastern Bloc and Soviet Union have exhibited remarkable diversity in their post-communist regime paths. Whereas some states have become demonstrably more democratic and have moved in the space of fifteen years from the periphery to the centre of European politics, in others the political and economic climates seem hardly to be better, and their societies no more free, than in the final years of the Cold War. Assessing progress towards democracy in the former Eastern Bloc - or the lack of it - requires a qualitative examination of post-communist polities. This collection of articles brings together a number of perspectives, both macro and micro-analytical, on the 'quality' of democracy in post-communist Europe. 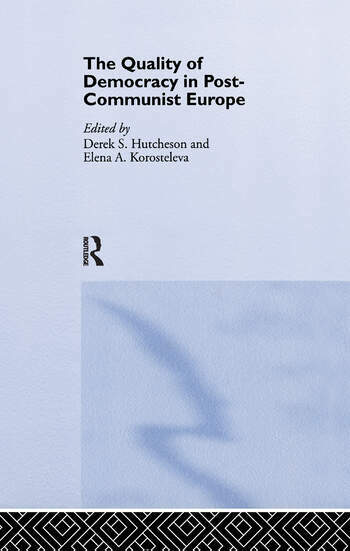 This volume was previously published as a special issue of the Journal of Communist Studies and Transition Politics.